We now have Long Term Capital Gains taxes on Stocks. This is perhaps something the market was expecting, and it’s come. As expected, gains till now are not taxed, only gains from now onwards will be. At 10%. And Securities Transaction Tax will still apply. It may sound unfair but that’s how it is. Forget Specifics, Should I Sell All My Long Term Holdings? Then What Is This Tax? You will now pay 10% capital gains tax when you sell a share 1 year or more after buying it. Note: Only if your capital gains are more than Rs. 100,000 per year. Per year for you. Not per scrip. For you as a whole. This is grandfathered till 31 Jan 2018. Meaning, whatever gains you had till 31 Jan 2018 are tax free. Only FURTHER gains will be taxed at 10%. And the concept applied to Equity mutual funds too. Let’s say you held a stock since 10 April 2015 till now with a purchase price of Rs. 100. Let’s say it was at Rs. 500 yesterday (Jan 31, 2018). You sell it on April 1, 2018 at Rs. 600. It’s long term held, since you have owned it for over 3 years. b) the price on Jan 31, 2018. In this case, it’s the higher of 100 and 500, which is 500. So the gain is sale minus purchase = 600 minus 500 which is 100. There’s a caveat. Let’s say you sold it at Rs. 400 because the market fell. Now you can’t take 500 as the purchase price and claim a Rs. 100 loss. It’s a complex thing that says if your sell price is lower than the Jan 31 price but higher than your purchase price, then boom, you have to take the sell price as the purchase price. Effectively, you pay no capital gains tax because sell price=purchase price and no gains. Okay But Why Shouldn’t I Sell? Because your gains, until Jan 31, are fully protected. There is no way you’re paying anything for gains made until then, even if you bought 10 years ago. So I’m taxed only on the gains after Jan 31? Yes. And that too, if you sell after April 1. Till April 1, this new rule doesn’t apply. Any stocks you sell this financial year are tax free on the gains if it’s held long term. But even if you sell after April 1, your gains till Jan 31 are protected. So no point selling and buying back. One point is that if a stock zooms up 50% from now till March 31, and you’ve already held it long-term, you can sell it for no additional tax. This is an edge case and because it is so, very few stocks will zoom up that fast, as there will be these tax-aware sellers. Great, so now I pay 10% Tax Only? No, there’s also a 4% cess, so 10.4%. On the excess gains after Jan 31. But there’s the Dividend Tax now, on Equity mutual funds. When you buy an equity mutual fund, you can take the dividend option. Many “balanced” fund types were selling their funds with the dividend option, so people could get gains as tax-free dividends. Now, equity funds will pay 10% to the government on any distributed dividend, and only then pay you the rest. So if a fund wants to distribute Rs. 3 per unit, then it has to pay Rs. 0.3 as DDT to the government and give you Rs. 2.7. This applies to Dividend Reinvestment options as well. Solution: Exit Dividend options and go to growth options. You may have LTCG but at least your dividends will be reinvested properly. Arbitrage funds were debt funds (net market exposure of zero) disguised as equity funds. Yes, they pay 10% DDT too. And you pay a 10% tax on gains when you exit, if there are gains. And then there are the FIIs…. Foreign Institutional Investors (FIIs) have come through the Mauritius or Singapore route thinking that hey, we won’t be taxed. Because the Singapore treaty was changed to say that they pay half of what Indian taxpayers pay, with shares bought before April 1, 2017 effectively grandfathered to have no taxes payable. Long term holdings were not taxed for Indians either so they paid nothing. This is a problem. Because an investor in, say, a fund/ETF in the US which invests in Indian stocks, like VWO, INDA or such, might sell units. Correspondingly, the fund will sell some shares in India. That money or the profit on that sale will be taxed at, say, 10%. The US investor gets something lower than expected. And then the US investor pays full US taxes on gains on his sell value. Effectively the gain was taxed at the fund level in India and at the investor level in the US. Since no other country seems to do this (the others that do are too small), Indian investments by FIIs will be a problem. We’ll see how they react. You don’t get inflation indexation benefits on the gains. You pay 10% on the absolute gain. But hang on, your gains from Jan 31 onwards won’t be indexed. Which is fine. Next year, there will be a new budget. And then, they will say oh, we should do indexation, so they will. Right now, we don’t need to bother. What If I Buy New Stocks Now? New stocks will have their purchase price as usual. The Jan 31 date is irrelevant for them. By the way, in case of SIPs in mutual funds, you will have an issue. 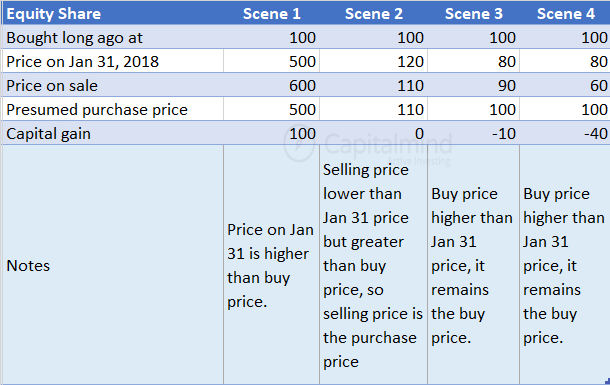 SIP units bought before Jan 31 can use the Jan 31 2018 purchase price. For those bought after, their own purchase price will apply. It’s complicated, yes. Unnecessarily, yes. But it’s like that. LTCG has come. It’s a good thing because in general keeping something tax free is not useful in the longer term. Now we will see the real value of equities. A bad side effect is that this pushes people to insurance products which are usually toxic. The government should consider a tax on insurance proceeds if you “surrender” a policy or get “maturity” benefits, again, grandfathered to the current date. But usually it’s abuse that drives taxation, so this will happen next year. Buybacks will continue. Because they are taxed at only 10% and that too for gains after Jan 31. Dividends are taxed at 20% at source and then if you get more than 10L, you pay another 10%. So buybacks remain attractive for distribution. The FII equation is the only troublesome one, because they are the ones that buy the large caps and they might shun India or reduce allocations. Other than that, the LTCG tax won’t hurt our economy. It might reduce some abuse, and it will result in some extra tax. Ask us more, at @deepakshenoy on twitter.